Joined the US Air Force in 1951 retiring 21 years later with the rank of Brigadier General. Flew 145 combat missions during the Korean War. Graduate of the USAF Experimental Test Pilot School and the USAF Aerospace Research Pilot School. Served a a Test Pilot at Edwards Air Force Base, California until selected by NASA. June 1965, Command Pilot of Gemini 4, the first 4 day mission by NASA which was highlighted by his Pilot Ed White’s first American EVA. 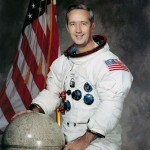 March 1969, CDR of Apollo 9, the first manned test of the Lunar Module(LM) during an earth orbital mission. 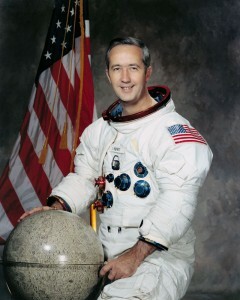 May 1969, named Manager, Lunar Landing Operations at JSC. August 1969, named Manager, Apollo Spacecraft Program overseeing all lunar opeations from Apollo 12 through to Apollo 16. Resigned over a disagreement as to who should command the final Apollo landing mission. Left NASA and the USAF in June 1972 to become Executive Vice-President, Corporate Affairs, Consumer Power Co.
March 1975, joined Pullman Inc., as Executive Vice-President & Director, becoming President of the Pullman Standard Division in October of that year. January 1981, joined Rockwell International as Senior Vice-President of Government Operations and Strategic Planning.